After the deaths of her father and her fiancé, the dashing Brion de Vaudraye, Climene is determined to purchase the mysterious old Vaudraye castle. Ignoring the advice of a guardian she’d never met (Captain Moreau), Climene moves into her unnerving new home . . . only to discover that it is rumored to the the gathering-place of a coven of devil-worshiping witches. When her guardian is murdered and Philippe–the “God of the Witches” who had been executed centuries before–appears in her house, Climene wishes she’d headed Moreau’s warning. Castle at Witches Coven is a predictable Gothic novel. It suffers from an unclear timeline, transparent villains, and an overwrought first-person narrative from Climene. Like in Janet Louise Roberts’s The Weeping Lady, author Virginia Coffman seems to forget that she is writing a period novel unless it suits her for atmospheric purposes. Among other things, the chance that any young woman would be permitted–at seventeen–to purchase her own mansion, then travel and live there unchaperoned, are slim. 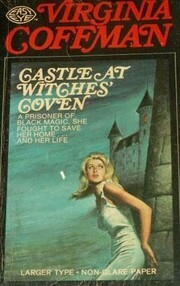 The cover of the edition I read even depicts a woman with 1960s garb and hair fleeing the castle. Coffman also has trouble depicting time passing. One moment characters are walking in the afternoon, and before long (at least, so it seems from the writing), it is after dark. In an overnight scene, a number of dramatic events occur back to back right after the heroine heads to bed. Then, as soon as the events come to a close, dawn breaks. There is no indication that anyone slept or that more than a few minutes passed between the various mysterious occurrences. Climene is not a compelling character, and her utter certainty at seventeen that she is prepared to handle anything gets wearying–especially since she shows little ability to stand up for herself. After all, she allows her new housekeeper, whose background she doesn’t even know, to hire her entire staff without giving any input of her own. Unsurprisingly, this means that Climene begins to fear her servants more and more–especially when Mrs. Gentil arouses her suspicions. She is equally unable to stand up to her creepy neighbors, clearly set up as the antagonists. As characters, the Comte and Comtesse de Lancre are caricatures. However, other characters balance out the Comte and Comtesse’s flaws. The local prefect, Hansard, is more nuanced (though not much). Better are Mrs. Gentil, who is an odd mixture of motherly and menacing, and Climene’s personal maid, Marie Orsini, who may nor may not be trustworthy. The best character of all, however, is the one who saved this book from a “Couldn’t Finish It” rating to a mere “Not So Good.” He also inspired me to dub the book “Steamy,” for he is a compelling, mysterious figure. At first, he seems to haunt the castle, but then he becomes flesh and blood–and an unwelcome and persistant visitor. Identical to the painting of the long-dead “God of the Witches,” the enigmatic Philippe de Vaudraye–who may be a resurrected spirit, or merely Brion’s émigré brother–is certainly an attractive figure. Skilled in unnerving people, he seems to have magical powers. Flowers come back to life in between his fingers. He does not appear to eat or drink. His hands are cold to the touch. He appears and vanishes at will. And he bears a red mark across his throat that reminds Climene of the first Philippe de Vaudraye’s execution. Then, there are his eyes . . . amber and enigmatic, they seem to study her during the day and by night from the centuries-old portrait hanging in her bedroom. At first, as I read Castle at Witches Coven, I complained that I wanted to finish the book fast, just so I could be done with it. As Philippe became more and more present, the pace picked up. I got more absorbed in the book. The climax–though over-the-top–is nevertheless interesting, suggesting that Coffman spent more time and energy plotting her book than researching and writing it effectively. In terms of romance, there is little I can say without revealing too much. Indeed, I fear I already have. The protagonists’ inevitable union is sudden, but I accept it and would have enjoyed seeing more. The reason for reading Castle at Witches Coven is to make a study of Philippe de Vaudraye. This is how a Gothic hero/villain/ghost/man ought to be written. In order to find him–the heart of Coffman’s book–be prepared to wade through a lot of dreck.